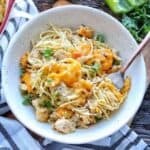 A chicken and pasta recipe that combines into a creamy, cheesy Chicken Spaghetti recipe that’s sure to become a family favorite. Using canned chicken and a packet of dry ranch dressing, this chicken spaghetti casserole comes together quickly. Add minced garlic and cook 1 minute. Stir in chicken broth, Greek yogurt, and dry ranch dressing packet. Stir in canned chicken and cheese. Using tongs, blend sauce with cooked pasta. Place spaghetti mixture into a pan coated with non-stick cooking spray. Bake 375 degrees for 20 minutes or until cheese is melted and golden brown.